Our Volunteer Activists are vital to the success Amnesty International enjoys in its protection of human rights. Our wonderful members make Amnesty’s efforts effective. Our researchers check the allegations and create the actions. Our staff distribute them and facilitate action. But it’s not until OUR MEMBERS ACT that we raise our voices in a cry for justice. And it’s membership that makes Amnesty International an organization that differs from most. We witness, we report, but we also act. Thank you for all you do. Every couple of weeks we will be recognizing and extending our thanks to one of our Saskatchewan Amnesty International volunteers. Bill Rafoss – was elected to the Board of Directors for Amnesty International Canada at the annual general meeting held a the end of May, 2015. He is a sessional lecturer in St. Thomas More College’s Political Studies department, and at the University of Saskatchewan. 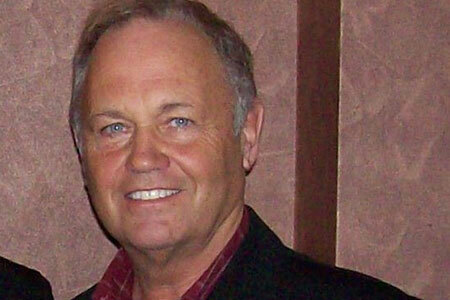 Active in the Saskatoon Branch of Amnesty International for a number of years, Rafoss decided to run for the Board to make a contribution at the national level. He was elected for a two year term, with his goals including to see human rights moved up on the Canadian government’s agenda; the Charter of Rights respected as it applies to issues like the detention and torture of Omar Kadr; do more as a country to help refugees who are in crisis, and to work towards a national inquiry into Canadian missing and murdered indigenous women and girls. The Board is made up of 10 people elected by the national membership. The work of the Board ranges from setting policies to approving the operational plans and the budget for Amnesty Canada’s work each year and ensuring that international decisions are implemented at the national level. Board members are a dynamic group of people committed to human rights for all and driven to make Amnesty an ever-stronger voice, both within Canada and within an international context. 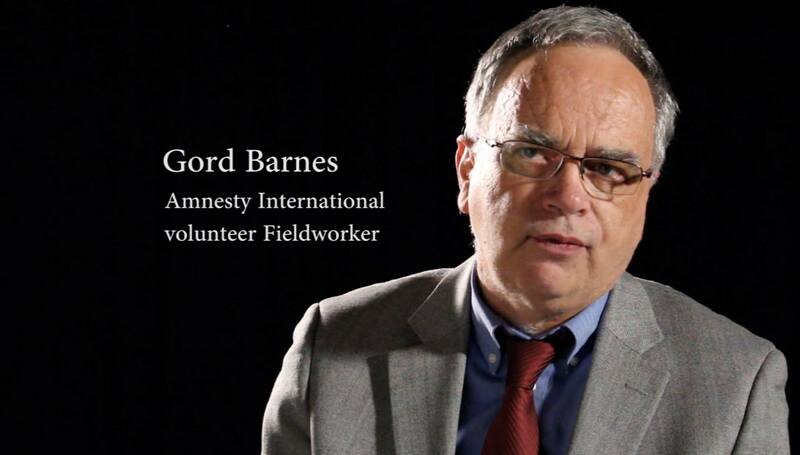 Gord Barnes – is a volunteer Fieldworker with Amnesty International Canada. He lives in Regina and has connected with many people throughout Saskatchewan to promote our human rights work. “I have met people who have had family members executed. Other people who have been prisoners of conscience, jailed solely for their political or religious beliefs who have eventually been released. I have met First Nations people who live here in Regina who have gone through the terrible experience of having a mother, daughter or sister murdered or who is missing. Fundamentally, I feel all human rights are universal, that the rights that are guaranteed in the Universal Declaration of Human Rights, all need to be enjoyed by everyone, I was involved with Amnesty International for a few years, writing letters and active locally here in Regina, and then (many years ago) I was encouraged by one of the AI Canada staff to consider applying tobecome involved in the volunteer Fieldworker program. I wasn’t sure I had the right experience and skills but I discovered this was a great way to learn more about human rights and about effective activism – I am grateful for being encouraged to do this. 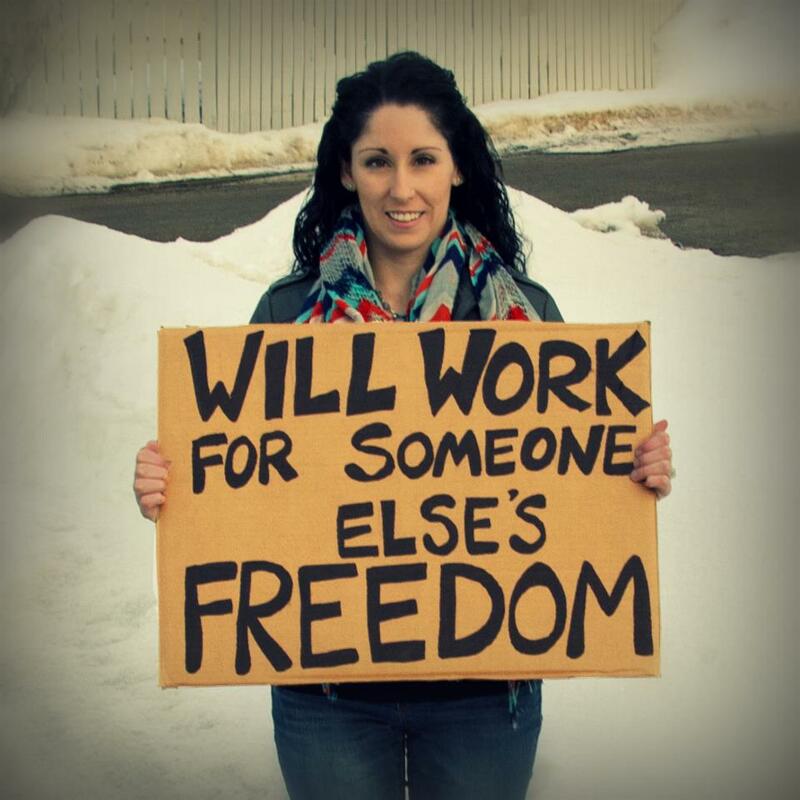 Crystal Giesbrecht joined Amnesty International Canada’s Fieldworker program in 2012. She is also a member of the Regina Community Group (AI 91) and has been getting together with other AI members in Regina to write letters over coffee on Tuesday evenings for the past 2 years. As a volunteer Fieldworker Crystal has spoken at many public events on behalf of Amnesty International. Crystal is a Registered Social Worker and works for the Provincial Association of Transition Houses and Services of Saskatchewan (PATHS) and has her Masters in Social Work at the University of Regina. Her work centres on the prevention of gender-based violence.